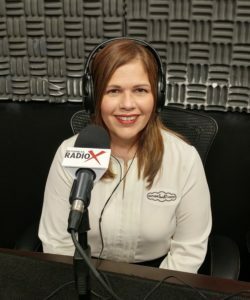 On a recent edition of “North Fulton Business Radio” on Business RadioX I interviewed Gloria Mattei, who along with her husband Sergio owns Nothing Bundt Cakes in Alpharetta – Milton. I started the interview by asking Gloria to give a general introduction. Did she mention the way cakes are made, all the different flavors, decorative accessories, her beautiful store, or her location? As obviously essential as all these elements of her business might be, Gloria mentioned none of them to start describing her business. Every business, no matter what the product or service it offers, possesses and offers intangibles to its customers which go beyond the product or service itself. These intangibles offer value the customer will pay for and pay for willingly. Gloria’s introduction focused our listeners attention on the intangibles of joy and celebrations. If I’m looking for a cake for a celebratory occasion, don’t I want to bring home more than just the same old store-bought cake? Don’t I want to bring some joy home? Don’t I want to put smiles on the faces of those I’m bringing this cake to? If I’m a business or corporate buyer looking to show appreciation to my customers, don’t I want to bring them more than just a predictable holiday gift? Don’t I want to bring joy and smiles? 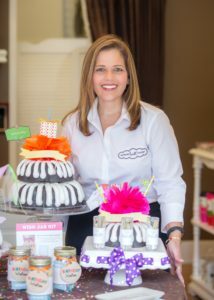 I do, as I’m a customer of Nothing Bundt Cakes and I’ve never paid much attention to how much the cakes I buy cost relative to the big box grocery retailers located all around Gloria’s store. I could care less. The reaction I invariably get when I show up at a client’s office or at home is worth the price I paid. Another intangible I receive by shopping with Gloria, by the way, is know that I’m supporting a locally-owned business which is heavily involved in supporting the community. She supports a wide swath of schools in the North Fulton area as a business partner in education, so much so that she was an Partner in Education of the Year Award winner, as recognized by the Greater North Fulton Chamber of Commerce, in 2016. Another charitable focus is on autism-related organizations, such as Lionheart School, as Gloria and Sergio have a son with autism. When I shop at Gloria’s store, I know that I’m contributing to the effort of local business owners who make giving back to the community an everyday part of their business plan. So what are the intangibles your customer values which enable you to receive a premium price? When someone asks about your product or service, how do you respond? Do you dutifully recite a product description? Or do you lead with the intangibles which draw customers in, the intangibles they’ll happily pay for? About me: I’m enthusiastic about how changes in pricing strategy can significantly change profitability for a business and enhance life choices for business owners. I live this passion through Ray Business Advisors, my outside CFO and business advisory practice, in which my pricing is exclusively value-based, not hourly. I work with business owners on how they can change their pricing not just to increase their profits, but better serve the wants of their customers. Click here to learn more or call me at 404-287-2627.